Hard Rock Cafe Fiji has the capacity to seat 150 guests comfortably with up to 300 guests allowed for standing functions, giving the freedom to tailor the venue to suit your individual requirements. Our location overlooking the marina makes for a truly memorable occasion, all within five minutes of all hotels on Denarau Island and fifteen minutes of Nadi town. 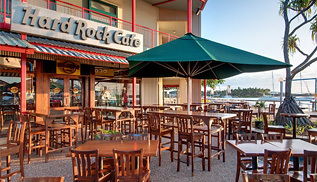 Hard Rock Cafe Fiji is the perfect space for unforgettable weddings, business meetings, and other social events. Our expansive floor plan and world class menu paired with our highly skilled event planning staff make us a fantastic location for your next private event. Meet, greet, rock, and party at Hard Rock Cafe Fiji.